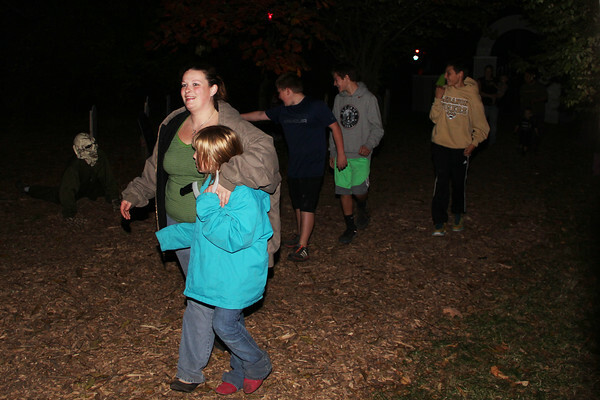 FRIGHT NIGHT: Leah Moore holds Julia Wiltermood, 7, close as Indianapolis' Mike Gootee crawls toward the first group to travel through Fright Forest at Abner Longley Park this year. Fright Forest hours run from 7:30 to 11:30 p.m. and the friendly hours are 3 to 6 p.m. with a friendly trail from 5 to 6 p.m. for younger children. Cost is $6 for adults, $4 for children ages 4 to 12 and kids 3 and under are free. Cost for the Fright-free fun is $3 per child and they should bring goodie bags.